Hopefully these quick above ground swimming pool installation tips will keep you from making some of the most common mistakes. The two most important things to remember when installing an above ground swimming pool are to make it perfectly round and perfectly level. That means use a tape measure and a transit type level. I use a laser level to first level the ground itself and then each individual footplate. This makes for a safer above ground pool. It also makes the pool a lot nicer to look at. It is very important to clear the ground of all vegetation. Once that is done use the laser and completely level the ground. Next, use your tape measure to lay out the bottom rail in a perfect circle. Oval pools should have round ends but the side braces need to be set according to the manufactures instructions. Again make sure they are perfectly level. At this point I treat the ground with grass killer and start moving in the sand. 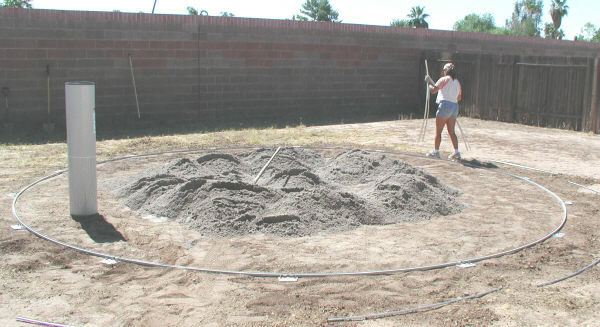 I pile the sand in the center of the pool and spread it out after the wall has been erected. Once the wall is up and the outside framework completely assembled I spread the sand and smooth it with a rake and broom. The rest of the installation is done from the outside of the pool. 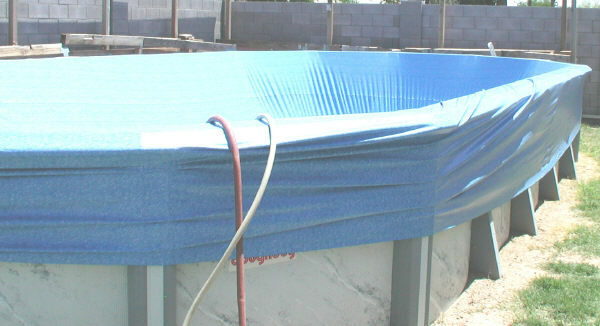 The liner then gets draped over the swimming pool framework and pulled over until it is just off the sand. As the water fills the liner is slowly released. When the water is at the edge of the pool coving it is time to shut off the hoses and take a few of the top rails off. Pull the liner over and install the coping and rods. If you move around the pool a few rails at a time you minimize the risk of the pool wall blowing over. Once a little more water is in the pool it is o-k to install the skimmer and return. When the above ground pool is full it is time to start the filter and jump in. That's the fast version. Visit the oval installation page or the round pool installation page for more in-depth above ground swimming pool installation tips. Visit my free e-book in progress here. Many more above installation tips can be found in the pages of Ask the Pool Pro. PoolSupplyWorld.com has the lowest prices on Doughboy pools!